Dining in Italy is one of the best parts of traveling here… but reading an Italian menu? That, we know, can be intimidating! While some restaurants offer menus in English, many local, off-the-beaten-path favorites don’t. Here are some helpful hints to help you choose not only where to eat in Italy, but how to navigate the restaurant’s menu, too! How do I choose where to dine in Italy? From big cities to small towns, most Italian destinations offer a range of dining options to suit every budget. And the establishment’s name usually helps you figure out how expensive your meal will be! For a laid-back meal, try a pizzeria (for, of course, pizza), a trattoria (usually a no-frills family-owned establishment), or an osteria or hosteria (serving up simple meals with a focus on wine). Want something more upscale? Head to a ristorante for an elegant ambiance, larger dining room and more extensive menu. Lunch usually is served from 12pm to 2pm, and dinner from 8pm to 10:30pm. Many restaurants take reservations over the phone. To ask for a table for two people at 9pm, for example, you’d say, “Vorrei fare una prenotazione per due persone alle nove”. (Check out our useful Italian for travelers guide for more indispensable phrases!). When you look at an Italian menu, you’ll see it’s divided into several sections, one for each course. You don’t have to order every single course, but the general rule of thumb is to order at least two (and you can split one of them). 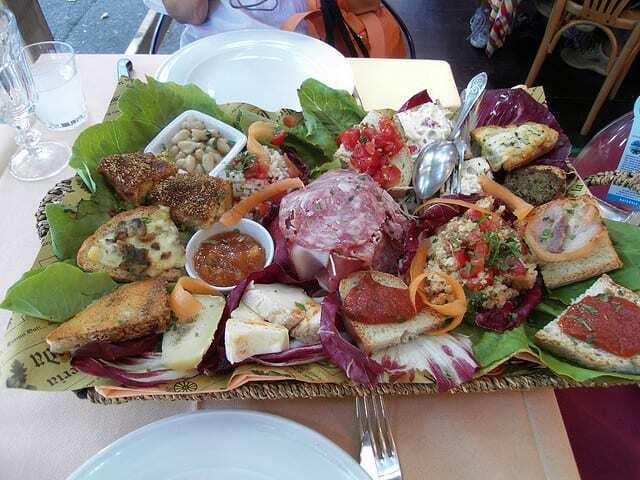 So a couple, for example, might share one antipasto, order individual primi, and then share a secondo. Here are what the different sections mean, and what food to expect under each! Antipasti: Similar to an appetizer, this dish literally means “before the meal.” For antipasti, most menus offer a wide variety of cured meats and cheeses, bruschetta (toasted bread with tomatoes and other toppings), and pickled or fried vegetables and olives. Ask for the antipasto della casa—the house special—for seasonal and regional specialities. Primi: Primi, or “first dishes,” usually include pasta, risotto (creamy rice) or soup. Pasta, of course, comes in an especially endless variety of shapes, sizes, textures, and sauces. 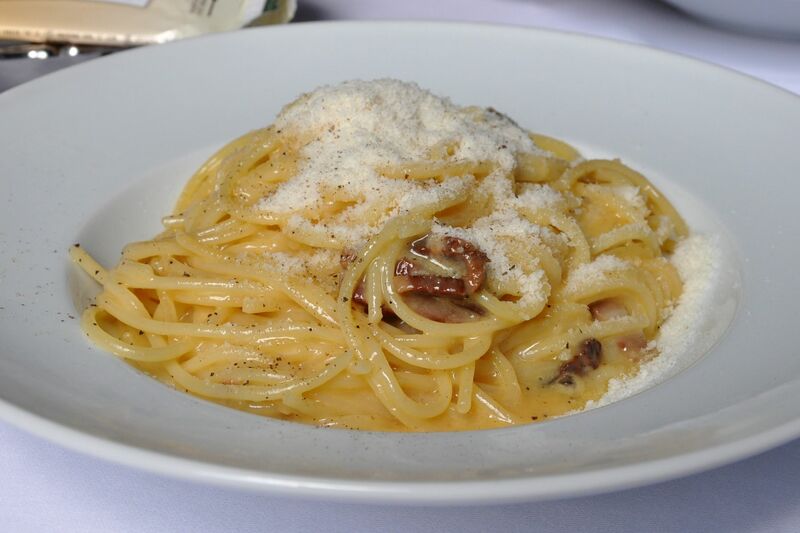 As with everything else on the menu, of course, these dishes will very much depend on what region of Italy you’re in. Many restaurants serve al pomodoro (tomato) and aglio, olio e peperoncino (garlic, oil and hot pepper). In Liguria, look for a pasta with pesto (basil, garlic and cheese; here’s what to know about pesto, and how to make it yourself); in Rome, pasta all’amatriciana (tomato, pork jowl and pecorino cheese) or alla carbonara (pork jowl, pecorino or parmigiano, and egg) (don’t miss our post on the best food to eat in Rome); and in Emilia-Romagna, ragù alla bolognese (ground meat and tomato) (here are more specialties from the Emilia-Romagna region). Remember that portions are much smaller than traditional American sizes, and many diners order a meat or fish entree to follow their primo. Secondi: This is a meat, fish or vegetable main dish, and usually most expensive area of the menu. 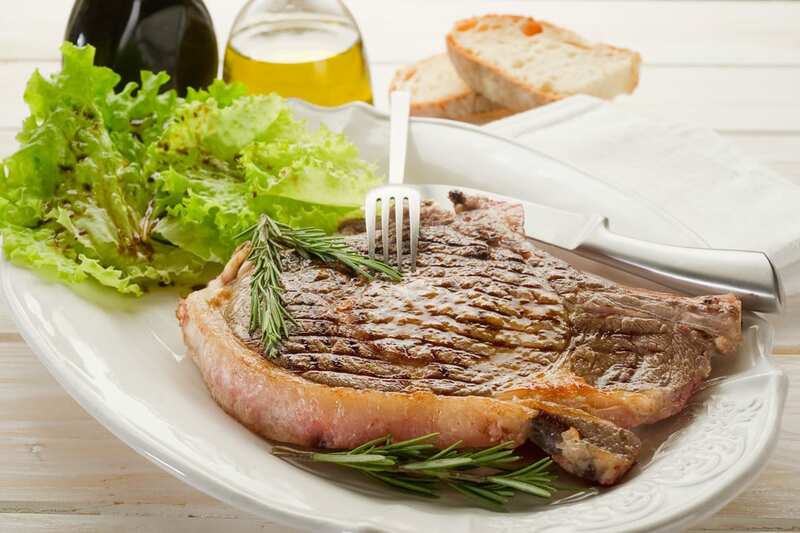 Popular secondi include pollo (chicken), bistecca (steak), manzo (beef), agnello (lamb), arrosto (roast), gamberi (shrimp), salmone (salmon), frutti di mare (mixed shellfish) and frittata (omlette). Regarding the preparation of the dish, look for the words al forno (baked), fritto (fried) and alla griglia (grilled). Items with a S.Q. indicated next to the name mean price according to weight, so don’t be afraid to ask your server for more details! Contorni: Primi and secondi don’t come with any sides or vegetables (unless otherwise noted). Popular contorni include grilled or sautéed vegetables, green salad and potatoes. Dolci: Many great meals end with a dessert, including gelato (here’s what to know about gelato in Italy! ), cakes and pies, tiramisù (a coffee and custard dessert), cannoli (ricotta stuffed in a crispy shell), panna cotta (cooked cream), and a cheese plate, just to name a few. 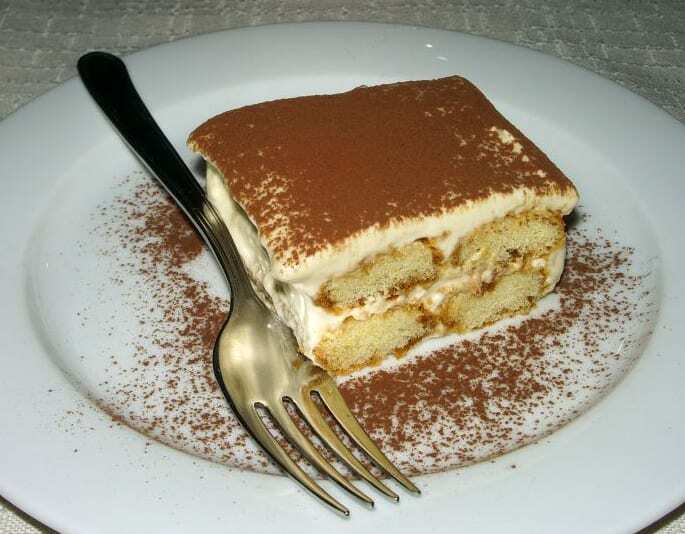 Ask your server for the dolci fatti in casa (homemade desserts) for an extra-special treat. Digestivi: Need to digest after your meal? 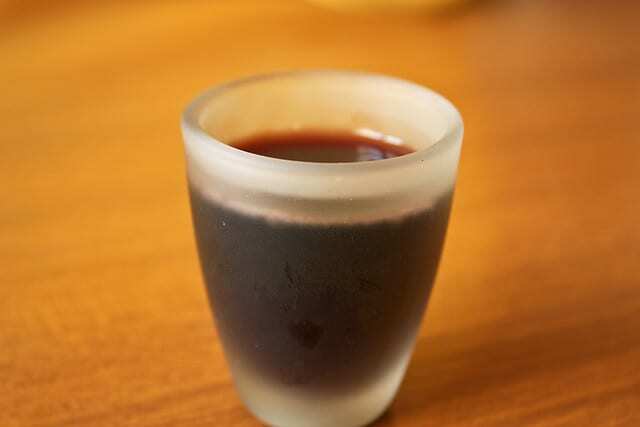 Do it as the Italians do… with a strong liquor! Digestivi are usually made from fruit: grappa from grapes, mirto from bluberries, and limoncello from lemons. Try cynar, made from artichokes, if you’re feeling adventurous! Another popular digestivo is amaro, bitter digestive; order it ghiacciato if you prefer it iced. Caffè: Coffee is often ordered after a meal, either normale (espresso shot), macchiato (with a drop of milk) or lungo (a “long” coffee). 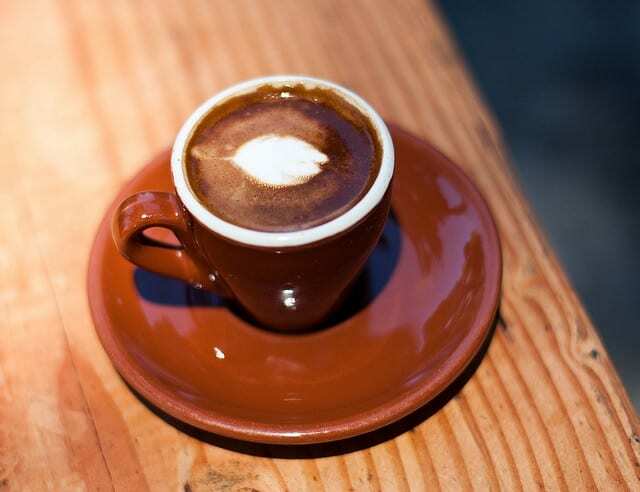 Cappuccino is never drunk after dinner: Italians believe that the milk will hinder digestion. Bevande: Another popular section of an Italian menu? The wine list, of course! Many restaurants offer white, red and sparkling varieties by the bottle or glass. Cocktails are very rarely drank with meals, and beer often accompanies pizza. Tap water is very rare to come by; it is customary to order a bottle of naturale (still) or frizzante (sparkling) water with meals. Don’t hesitate to ask your waiter for a recommendation about what to eat (“Cosa ci consiglia?”), request a translation of ingredients (“Cosa vuol dire…?”), or alert your server to any food allergies (“Ho una grave allergia alimentare a…”). (If you have any allergies or food restrictions at all, make sure to see our post on eating as a vegetarian, vegan, celiac, or someone with food allergies in Italy!). An extra fee, called coperto (or sitting charge), is almost always tacked onto the bill. On some occasions, and usually only in touristy areas and restaurants, servizio (a service charge) is added, too. If servizio is added, don’t tip at all; if just the coperto is, you can feel free to simply “round up” on your meal and leave a couple of extra coins, if you enjoyed it. And don’t miss our post on how not to get ripped off eating in Italy. Previous articleHow to Make Fresh Pasta… At Home! Very good post on reading an Italian menu, this will cover most of the situations you encounter. I agree with the “Cosa ci consiglia?”, as the wait staff usually know what’s best, and fresh and in season for that time of year. And the cynar, although it takes some getting used to, is actually not that bad. However, I prefer a good limoncello. Would it also be suitable to ask “What is the speciality of the house?” I *think* that translates to, “Qual e la specialita della casa? Or is there a better way to ask? That’s exactly right Emily! Brava and buon appetito! I liked that you explained that Primi means the first dish, and is usually a pasta or soup. My sister really loves Italian food and she wants to get that catered for her bridal shower. I don’t know much about Italian food so this information will help me know what to order. Italian menus are a lot different from the regular menus as Italians love to present everything in a very stylish & fashionable manner. I had a chance to have dinner in one of the top restaurants in Italy and forget food I get highly impressed with their menu covers.